Art director and designer living in Atlanta, GA. 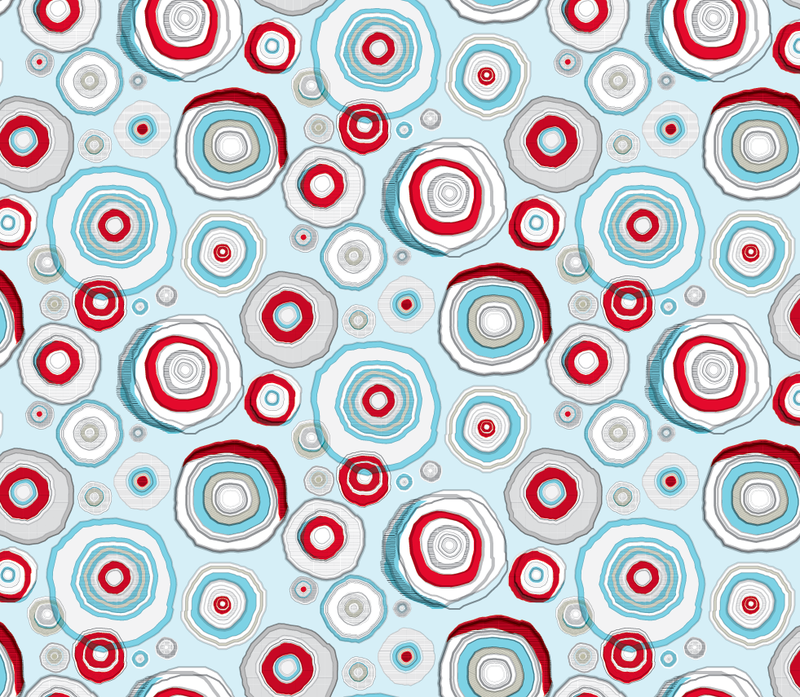 Above is my final digital textile print !!! 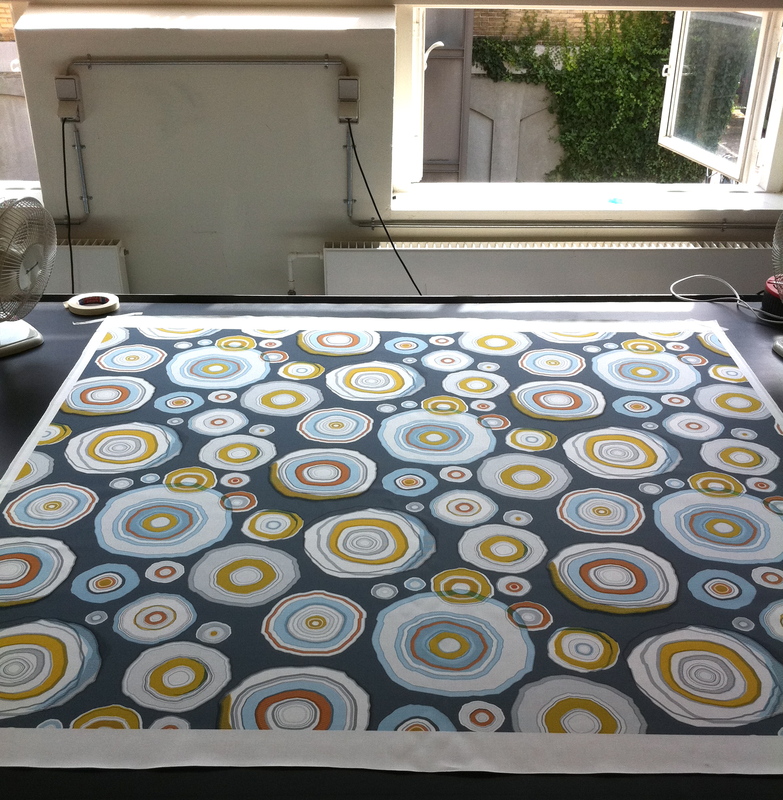 It’s all lead up to this 130x130cm piece of fabric. At this point (above) in the printing process it was drying before the washes started. While digital printing seems quicker because everything is printed from a super fancy fabric plotter, you still have to do ALL the washes. 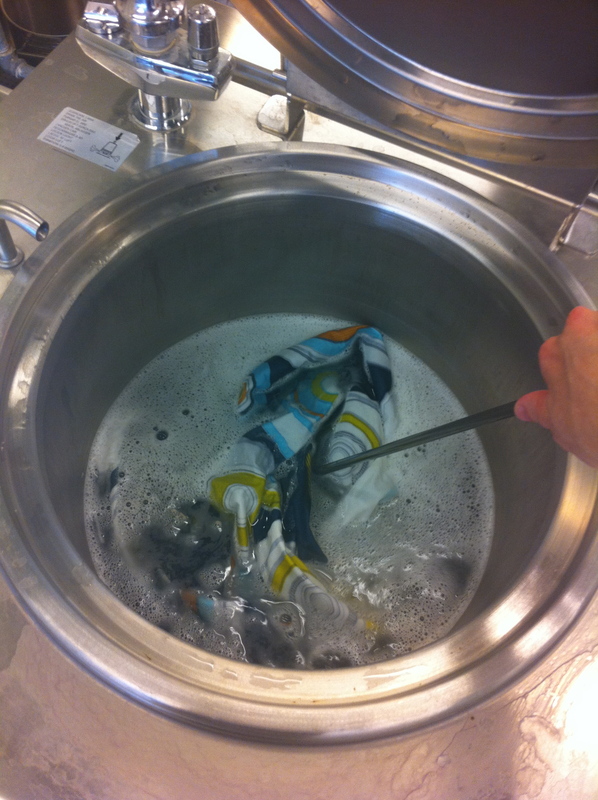 Also steaming and washing a huge piece of dark fabric is also tricky … and heavy when wet. But after a few hours of work, my piece is printed, steamed, washed, boiled, washed, dried, and ready to hang! I’ll give you a guys a peak into the process for the creation of my print. 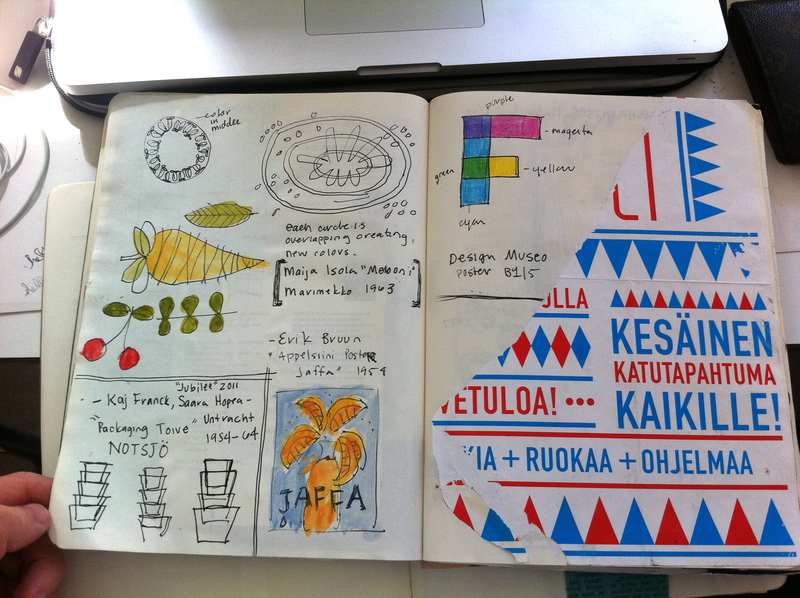 As for inspiration for my print I kept noticing/sketching circle patterns. I noticed them again and again on our study tour. Circles were in the piles of wood, on the manhole covers, street signs, and were strong elements in one of my favorite monuments in Finland. 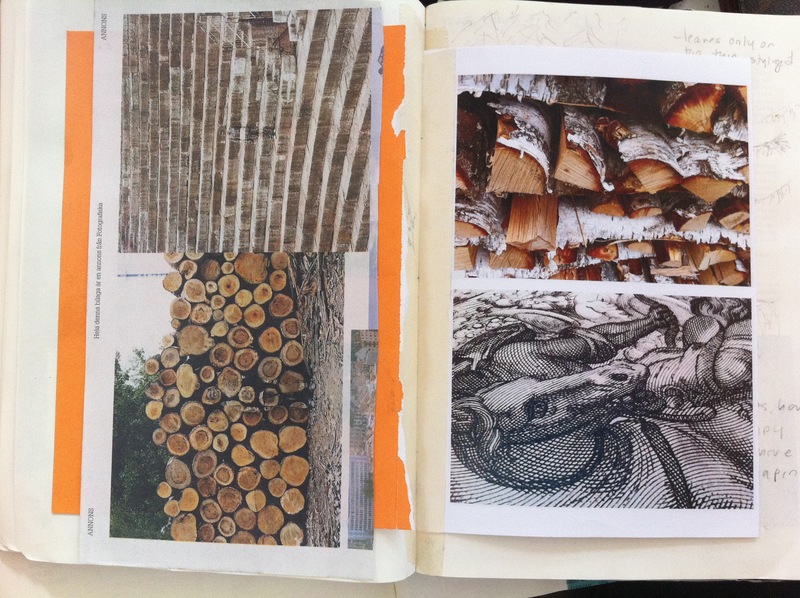 During the study tour our primary task was to create a sketchbook documenting our inspiration. 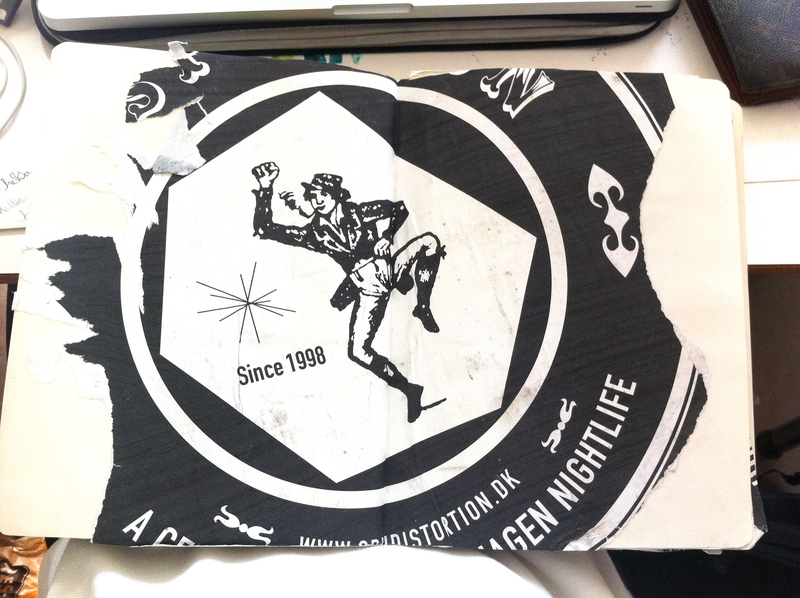 I collected and drew anything I found or saw that was interesting. 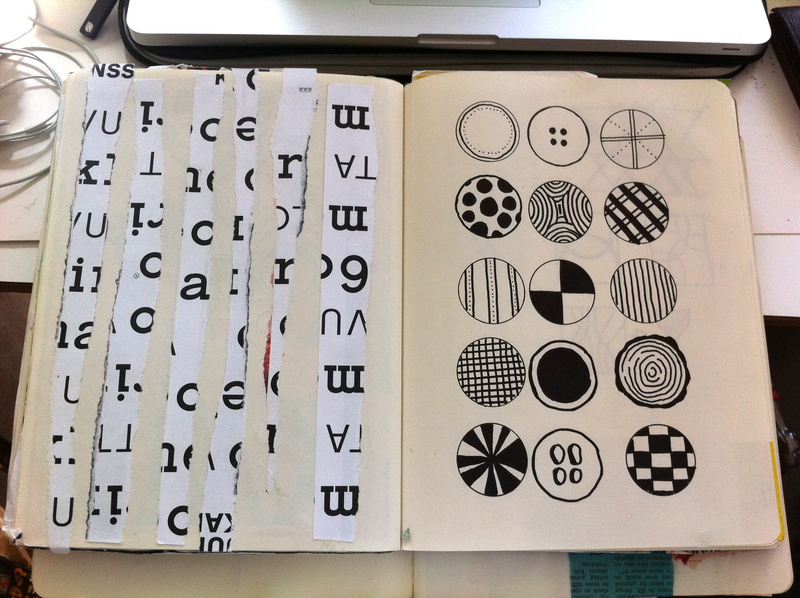 Here are a few of my favorite pages, many of which you’ll see inspired my print. 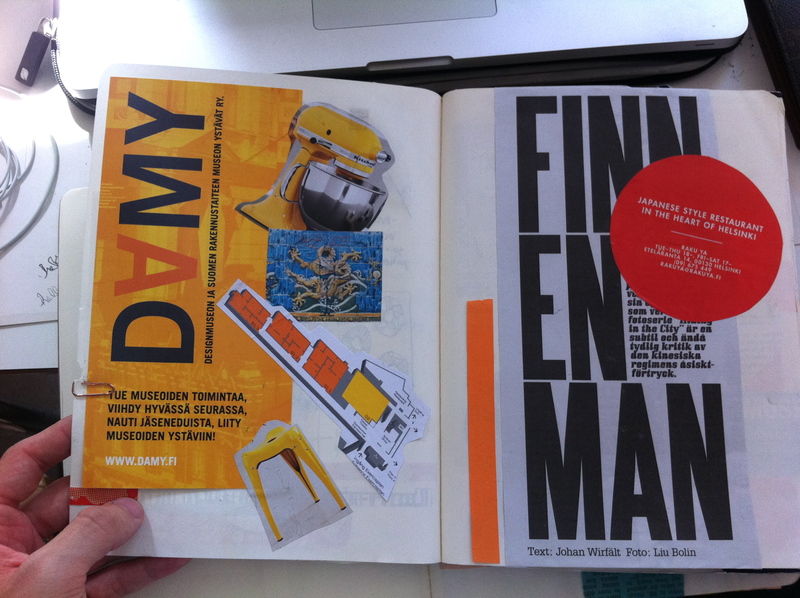 Above: The yellow and oranges here were used in my final print. 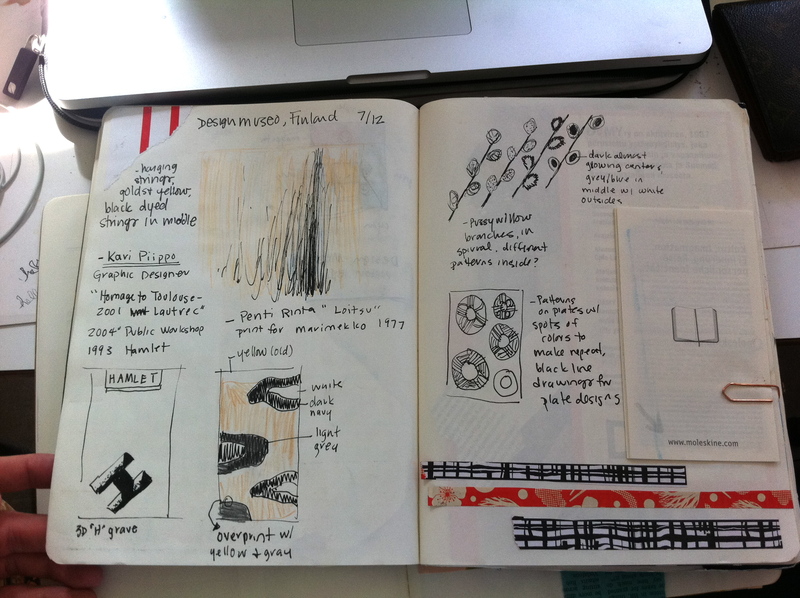 I have an entire Moleskine filled from the study trip. Normally when I go on trips or look for inspiration I just take photos. I think to myself, “I have a photo, that’s enough, I can go back to it later.” But how many times do we actually go back to those photos? Not very often in my case. 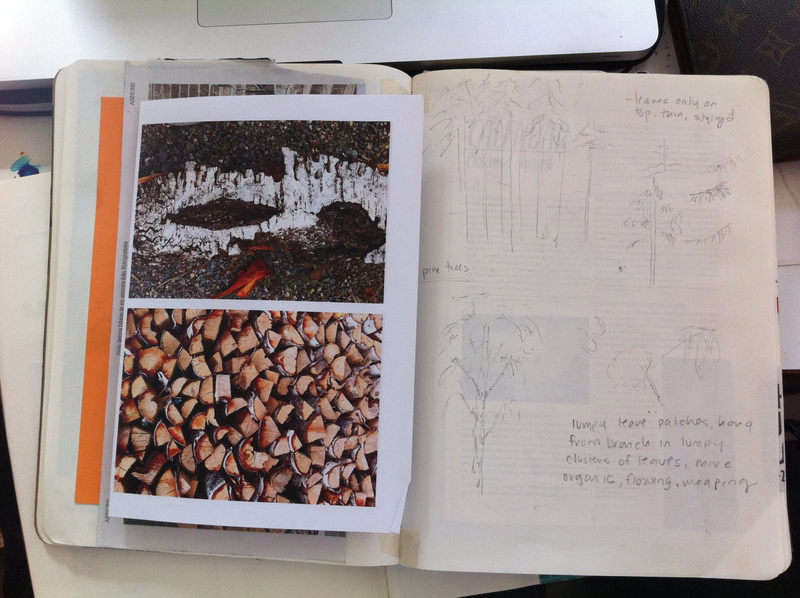 Drawing the actual thing, or printing the photo out and writing notes about it in a book crystallizes the memory so much more vividly. 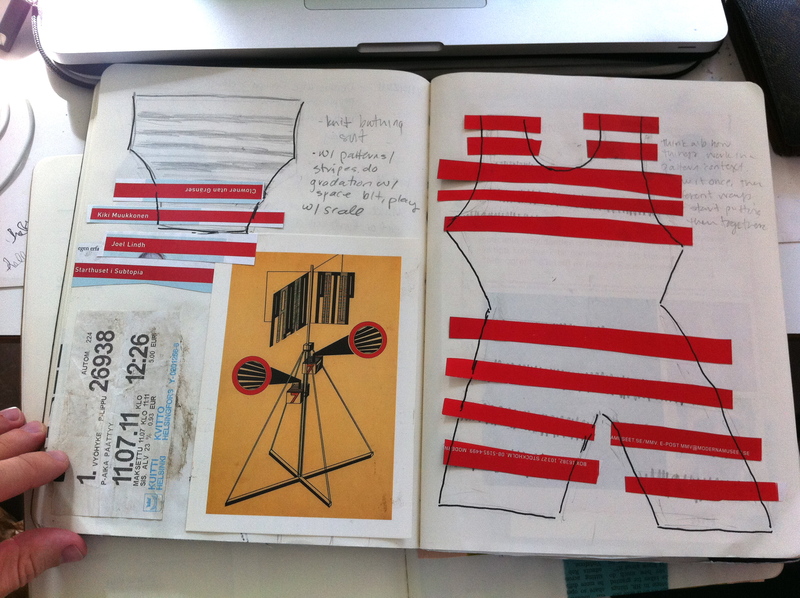 I took found pieces of design I liked, booklets, posters from the street, and combined these with drawings, color swatches and notes to create a visual diary full of inspiration. Now anytime I want to look for an idea from the trip, it’s all in one place, and having a physical object is so much nicer than photos on the computer. 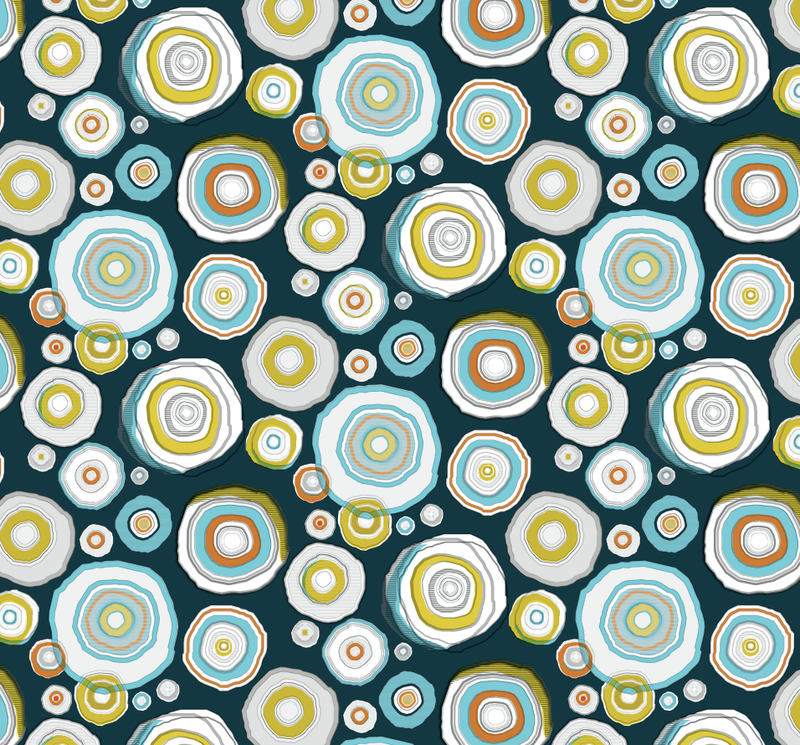 So I knew I wanted to create a pattern with circles, and I’d been greatly inspired by all the Scandinavian design I’d been experiencing over the last few weeks. In the beginning a lot of my designs were very retro looking, which I liked. 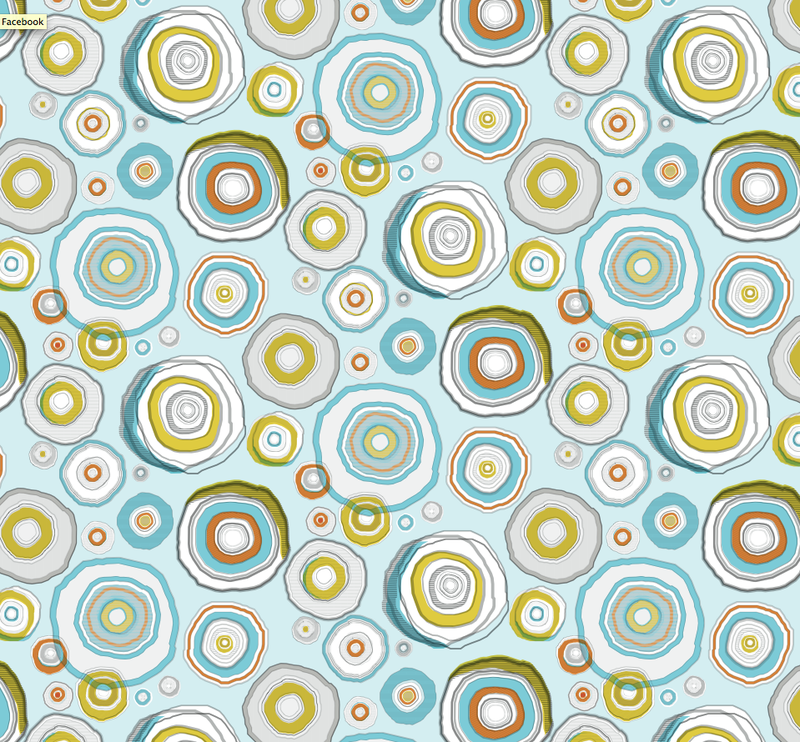 But this direction got away from my original idea creating a pattern that dealt with circles, in wood specifically. The rings of a tree make really beautiful patterns in wood – so why not a print ?!? So I began to move back to that direction and I came up with this final design (below). Above: The final print and color way, dark blue background with accents of white, yellow, and light blue. Above: Light background color way. I liked this too but thought the dark background had more depth and contrast. Above: For some reason this reminds me of candy – like candy canes. 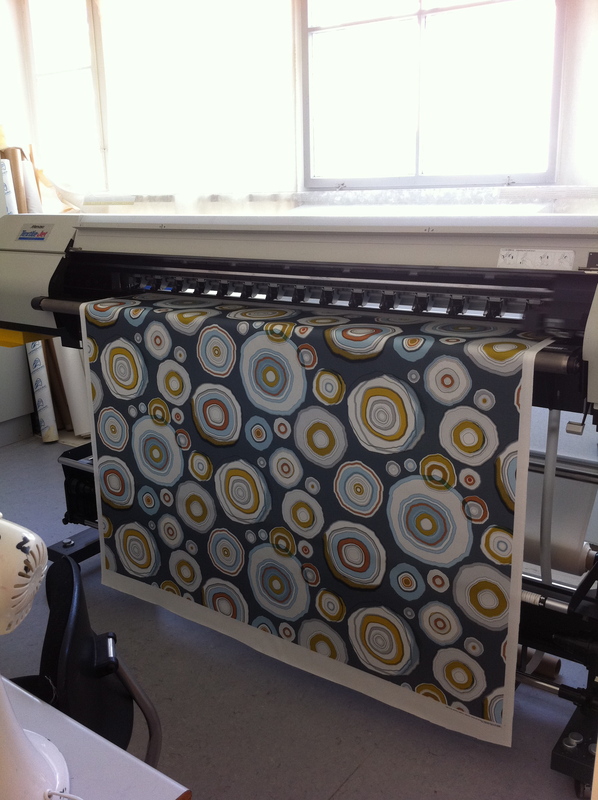 The textile prints from a fancy digital textile printer .. Fabric is loaded like a roll of paper then printed on. 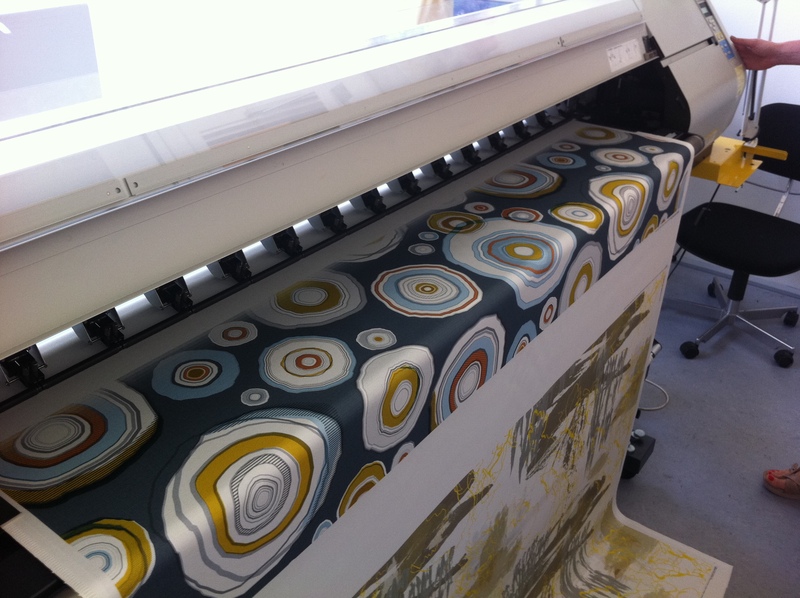 The textile drys on a rubber table immediately after printing. 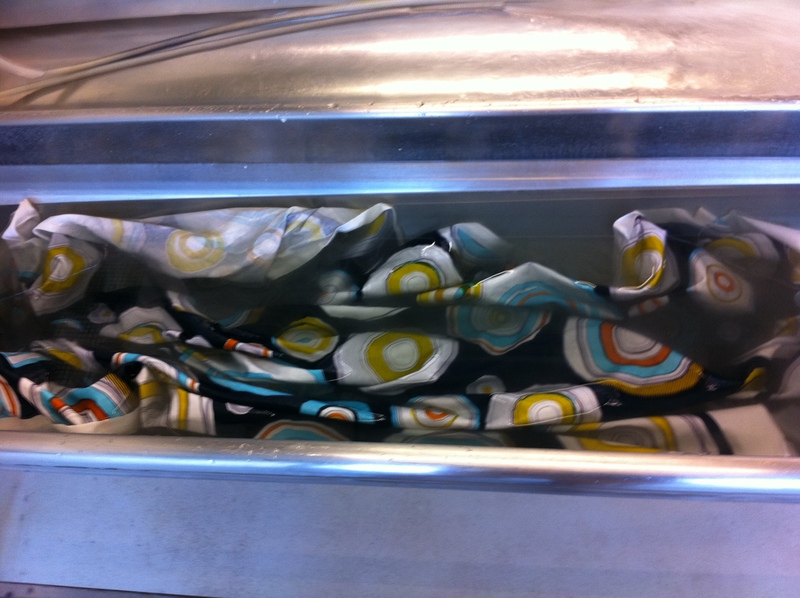 After the print dries from printing, it goes through a series of baths with cold to warm water. Then the print boils in soapy water for 10 min. Then it’s washed one more time and dried.